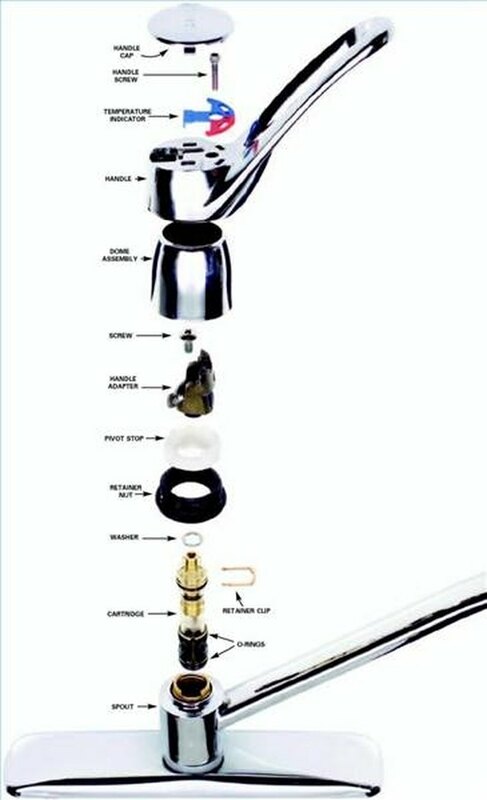 How Does a Cartridge Faucet Work? A cartridge faucet is so common you've probably seen dozens and not even noticed. It's a simple faucet, but instead of having two separate taps or knobs for both hot and cold water, there's simply a lever above the spigot. Raising the lever turns the water on, while pushing it down turns the water off. Pushing the lever further to the left makes the water hotter, while pushing the lever to the right makes it colder. The design of a cartridge faucet is more complex and includes smaller parts than a faucet with separate taps. Both hot and cold water lines run up to the base of the faucet, inserted into a diverter mechanism set just below the spigot called a cartridge. Above the cartridge is a series of seals to prevent water from passing out the top of the control lever. Set between the control lever and the cartridge are several rubber cushions to allow the lever to be moved without causing undue wear to the entire assembly. The cartridge is the entire basis for the faucet's function. It contains a rocker switch capable of blocking off or opening both hot and cold water lines entirely, as well as to varying degrees. In other words, when you raise the lever to turn the water on, you're pushing the cartridge forward, causing both water lines to unblock. When you push the lever down, both water lines are blocked entirely, turning off the water flow. This is the simple part, the genius of this device is that, based on how far the lever is pressed to one side or the other, the hot and cold water lines are opened at different ratios. When centered, the cartridge lets water from both lines pass equally. When pressed to the left, the cartridge lets more water from the hot line pass than the cold line until the cold line is blocked entirely. Similarly, when pressed to the right, the catridge lets more water from the cold line pass than the hot line until the hot line is blocked entirely. How Does a Single Handle Shower Faucet Work? What Is a Posi Temp Faucet?